MANCHESTER: Arsene Wenger was honoured by Manchester United on his final visit to Old Trafford as Arsenal manager, but left beaten once more on the field as Marouane Fellaini’s stoppage time header handed the hosts a 2-1 win. Wenger was greeted by former United boss Sir Alex Ferguson and current manager Jose Mourinho before kick-off and even presented with a glass momento. However, the Frenchman was left empty-handed when it came to points as defeat left sixth-placed Arsenal mathematically out of the race for a top-four finish. Fellaini rose highest to flick home the winner after Henrikh Mkhitaryan’s second-half strike against his former club had cancelled out Paul Pogba’s early opener. United have now sealed their place in the Champions League next season and move closer to their target of finishing at least second best to champions Manchester City by opening a five-point gap on Liverpool. Ferguson told the United website ahead of the game that his clashes for many years with Wenger’s strongest Arsenal sides over a decade ago “made the Premier League.” But it was a sign of how far Arsenal have fallen that Wenger made eight changes from the side that drew 1-1 with Atletico Madrid in the first leg of their Europa League semi-final on Thursday as he had already given up hope of a top-four finish. Alexis Sanchez became the latest of a number of leading Arsenal players to leave towards the end of Wenger’s reign in search of more success and more money in January. And in his first appearance against his former club, the Chilean was heavily involved in the opening goal on 16 minutes. Romelu Lukaku picked out Sanchez at the back post and after his header was deflected onto his own post by Hector Bellerin, Pogba had the simple task of tapping into an unguarded net. Wenger included club record signing Pierre-Emerick Aubameyang and Mkhitaryan, who was the makeweight for Sanchez to move in the other direction, among a side littered with youngsters. But it was the visitors who posed the greater threat for the remainder of a soporific first 45 minutes. Mkhitaryan dragged a shot from the edge of the box just wide before Aubameyang’s tame header was too close to David de Gea. United suffered a blow at the start of the second period when Lukaku limped off to be replaced by Marcus Rashford. And the hosts soon also lost their lead when Mkhitaryan pounced on some slack United defending to fire across De Gea into the bottom corner to muted celebrations despite enduring a troubled 18 months under Mourinho before joining the Gunners. 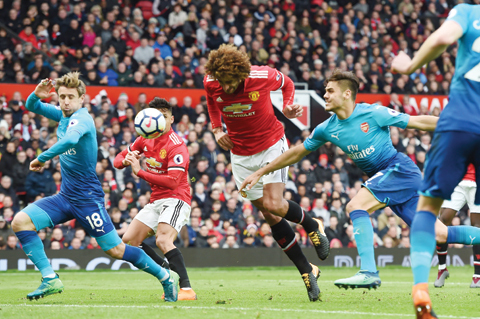 United struggled to create in their search for a winner, but Arsenal failed to heed their warning when Rashford was denied by the offside flag after Fellaini’s header came off the post a minute from time.